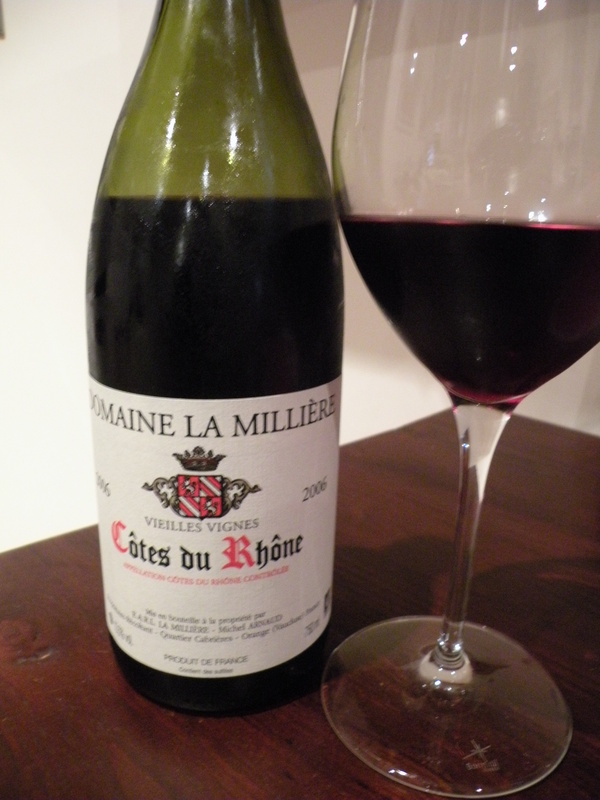 From another stalwart Chateauneuf du Pape producer, comes this elegant, silky Cotes du Rhone from Domaine La Milliere which is serious value for money. Made mostly of Grenache from 100-year-old vines?! Are you kidding me….Awesome stuff. Ruby red color, with hints of apricot and spice. The Chateauneuf must be amazing. I will have to try some at some point, but I’m sure it retails for much more. You can find this Cotes du Rhone at Uncorked Wines in the UK for about 10£ a bottle if you buy a case. Available at Zachys in NY on sale now for $15.00 a bottle. An absolute steal….If you like big, smooth red wines, you will not be disappointed. This will obviously pair well with rich meaty dishes, but a pleasure to drink on its own. Robert Parker give is 87 pts, but I think it deserves higher, my rating 90pts. The 2006 Cotes du Rhone is slightly more austere and lean, but still very good, almost tasting like a premier cru from Burgundy’s Cote de Beaune. Both wines should be drunk in the next 3-4 years.This is an estate to take notice of, as recent evaluations in this guide have certainly made abundantly clear. This is another great example of young emerging newcomers, in this case Aime and Michel Arnaud, doing all the right things to turn out some impressive wines. This fine estate offers two very tasty, inexpensive Cotes du Rhones.